Contact us if you are interested in adopting a horse! If you cannot take a horse home with you, you can SYMBOLICALLY adopt a horse! The world can be a cruel place and most of the hundreds of horses we have rescued throughout the years have experienced it. As noble souls, horses seek only to cooperate. They avoid conflict if at all possible. Their gentle nature is what makes them so easily abused. Horses want peace, comfort, care and dignity. Many programs are available to facilitate your journey to partnership with a horse in need! We field many calls each week for horses needing homes. 99% have already given their best to their humans and are being discarded as aged or unsound. Inquire if you are the rare soul who may truly remain at a horse's side as he or she journeys through this life. Manageably sound horses are available as companion or pasture pal partners. The adoption fee for a horse is the least amount of money to be concerned with. There is no such thing as a FREE horse. Figure about $20 a day in your backyard to $2500 and up for a boarding barn (out by us anyway). Add in routine veterinarian and farrier services. Then add in miscellaneous necessities and have a vet emergency fund readily available! Our adoption fee is $1500.00 for a riding horse. $1000.00 for a companion. Sometimes the fee is waived. Our newest and most exciting program yet! Book an hour in 2019 with the founder of Amaryllis Farm for a customized, personal session on our breathtaking sanctuary with a very special horse. ​ is available if you are unable to traditionally adopt! This is an essential program for the elderly and unsound equine residents! It pays their expenses! Horses don't have retirement funds and the finest still find themselves in trouble as they age out of employment! There are several options of Symbolic Adoption! Permanent: A permanent symbolic adopter is $20 per day. Partner: A partner symbolic adopter is permanent and $10 per day. Temporary: A temporary symbolic adopter is for any period of time and $20 per day. This is a great gift idea for someone who loves horses! Three opportunities to enroll in 2019! Learn all about horses and horsemanship from the experts. This is not a mounted program but it is often hands on so dress accordingly. Complete a session and receive your tuition ($500.00) credited back to you on a full year symbolic adoption! Graduates receive the IHHC handbook and an opportunity to apply their newly acquired knowledge and work further with the horses when positions open! Register today! Class minimum of 2 students, maximum of 4. Peace. Serenity. Fun. Safety. Nature. Judgement free zone. We are celebrating our 30th Anniversary by diggin' into our ole' western roots and bringing you a hootin' tootin' good time with the friendliest cowpokes this side of the Mississippi! Welcome to our OK Corral. Join Cactus Chris and Wrangler Rachel and learn how this here outfit works! There will be ponies to love on, trails that need blazin', adventures to be had all during camp and even stories to be told around the campfire and chuck wagon! It is no tall tale! Camp is only $600 per week! Every week has a different theme! This year's camp riding is in a western saddle and walk only as we ride in numerous games and expeditions within our 10 acres with ground leaders. Ages 4+up are sure to have a hootin' tootin time! So, dust off them boots and put on that hat and mosey on over to the good ole' folks at the Wild West of Amaryllis Farm...where horses have as much fun as their cowpokes who love 'em! Enroll now. Camp is limited to 4 children each week. Please email christine@amaryllisfarm.com to register! 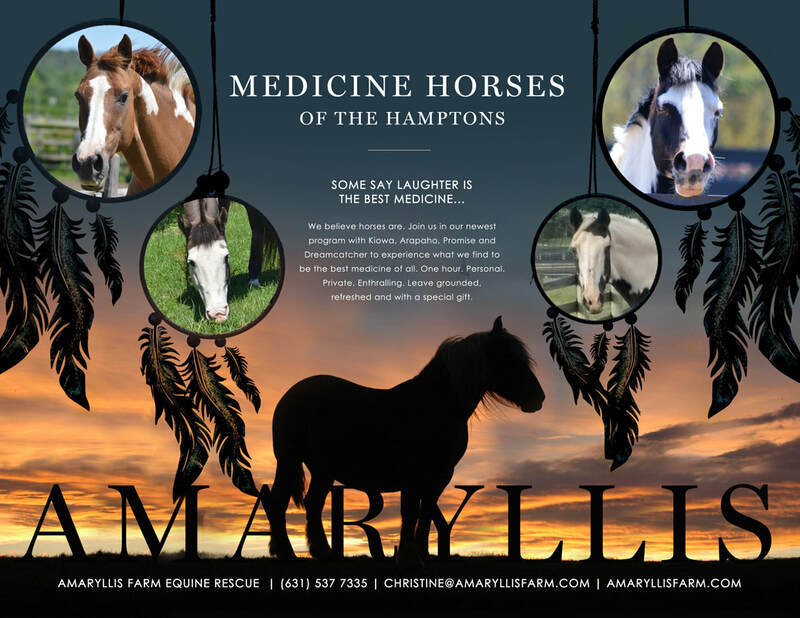 Since 1989, Amaryllis Farm has offered the best and safest introduction to horses! The best rescuer is actually the person who keeps their horse and ensures their care as they age. Every one of our programs attempts to sway current and future horse owners to KEEP THEIR HORSES WITH THEM THROUGH LIFE. ​The real horse whisperers 'hear' and acknowledge the horse's mental, physical and yes, emotional needs. Then they meet those needs. A personal, private and intensive year with a horse. Assisted. Extraordinary. Life got you down? Inquire for full details on the equine assisted life project year!